Reality Check: Are a quarter of Scottish children in poverty? The claim: 260,000 children in Scotland are living in poverty, 40,000 up on last year. 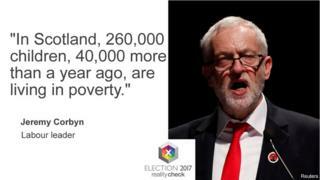 Reality Check verdict: The best available figures suggest he is right to say there has been a jump in child poverty in Scotland to 260,000 after several years of little change. Labour leader Jeremy Corbyn addressed the Scottish Trades Union Congress in Aviemore on Monday. He highlighted the increase in relative child poverty in Scotland, saying that 260,000 children are living in relative poverty, which is up 40,000 on last year. The figures come from a Scottish Government publication, which calculates relative poverty as living in households with incomes below 60% of the median income for the UK, after housing costs have been paid. The median income is the one for which half of UK households have a higher income and half have a lower one. The most recent figure is for the financial year 2015-16, and suggests that 260,000 children were living in relative poverty after housing costs, which is 26% of children in Scotland. That's up from 220,000 or 22% in 2014-15. The figures in this report come from the Family Resources Survey, which collects information about 2,700 households in Scotland. That's a large survey, but it still has a margin of error, so when it suggests that 260,000 children are living in poverty it means that the statisticians are 95% confident that the actual figure is somewhere between 190,000 and 320,000. That means that even though 40,000 is an unusually large increase, it is well within the margin of error and so the change is not statistically significant. The Scottish Government proposed a Child Poverty Bill last year. The bill will set ambitious targets for reducing child poverty by 2030. The report itself warns against placing too much emphasis on a single year's figures. "More data will be required to judge whether these changes are indicative of a longer term trend," it says. Nonetheless, these are official figures and they are the best figures available, suggesting there may have been a jump after several years of little change.